Ever wanted to get some sleep during a train ride, or a quick powernap on the bus to work? You either hoped to wake just in time not to miss your station, or set an alarm to wake you far too early... Let iNap wake you when you get close to your stop! iNap is a 'next-generation' travel alarm. 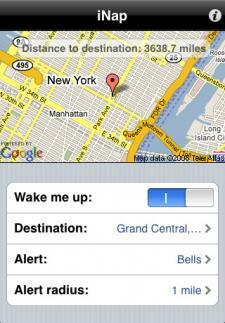 Using the GPS in your iPhone it will determine where you are, and wake you when you are close to your destination! iNap is available for $0.99 and works best with an iPhone 3G (with real GPS).